When I would FC small-gang null-sec roams, I liked to have two bubblers along: a "double bubble" cloaky Flycatcher and a single bubble cloaky Sabre. This is the latter. The former will be FOTW next week. The Flycatcher's job was to get a quick initial tackle on the target or targets, usually around a gate, often on both sides of a gate. I'll talk about Flycatcher tactics when I talk about the fit. The Sabre's job was more the fun follow-up to the Flycatcher, but also more dangerous: get in there and make sure the target or targets don't get away! Think of the role as a bit like a "heavy interceptor." Alternately, this Sabre works particularly well with a cloaky warp-in point. Drop on the target, and launch that bubble. Then burn in and scram him. Hope that your Logistics pilot is alert and in range. ;-) If your FC knows what he's doing, he should be. Once you get in close, you can shut down the MWD and orbit close as you like at around 450-500 m/s, depending on skill. Your tracking with 125s is superb. The low sig radius and high tank (for a destroyer hull) will make you difficult to dislodge with logi support, and you do excellent up-close damage or alternately can tear drones to shreds. If your FC doesn't want or need a cloaked Sabre, then you can trade out the Overdrive Injector for a Gyrostab and there should be just enough CPU left to wedge in a 7th gun. Before you launch in this ship, learn what your FC expects! Bubblers are the toughest ships there are to fly well, and FCs will be very specific about what they want you doing. Some FCs will demand that you only use the bubble when they order it. Others will expect you to show some initiative about when to drop it. It's generally a good idea to fly with an FC a few times in a ship other than this one to learn his style and what he wants from his bubblers before you offer to be a bubbler for him. Also, make sure your bubble launcher is far away from your F1-F4 keys. It's the one module you don't want to activate by accident, but only with a lot of forethought behind it. Something go by that you don't think you can take? Stay cloaked. You can even use an alt in a cloaky scout on the other side of the gate to see what's coming and prepare yourself. Fair? Fair's for the other guy. A lot of players like to adjust the fit, either with afterburners, a web in addition to the scram, or both. There's a good bit of lee-way in this fit to make those sorts of adjustments. Find the exact variant you like! One more thing: for clarity, I've rearranged the modules so that the types are grouped. When you actually fit it, though, the order of your highs should be: gun gun, cloak, gun gun, bubble launcher, gun gun. Your mids should be scram, extender, MWD, extender. You can then rearrange the function keys once you get it undocked the first time (hint: F1, cloak; F2, scram; F3, guns; F4, MWD; Ctrl-F8, bubble). As I mentioned a few FOTWs ago, it helps your overheating if you get some heat sinks in between the modules that you're going to be over-heating a lot. It's not as pretty on the fitting screen, but it's more effective when actual combat begins. Chances are, you're not going to be bringing this Sabre home, so you may as well spend a lot of time overheating stuff. ;-) Carry some paste to repair the inevitable damage. 100 or so units should be enough. A little over a month ago, I wrote a blog post called "Not all curves are pretty". If you take away the player guides that I write for EVE and for Global Agenda (both of which are far and away the most-read things on this blog), it's the most-viewed blog post I've ever written. It swept through the EVE blogs, news sites, various alliance forums, and even hit a site or two in the external media. 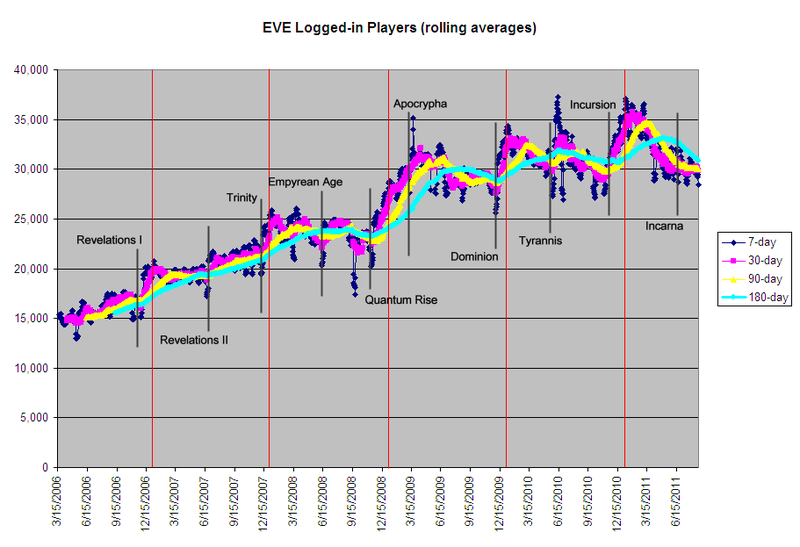 The post itself covered some mathematical analysis of the average number of players logged into EVE Online over a five-year period starting in March 2006. The source of the data was the API output of eve-offline.net, a website that's intended to help players determine if EVE is itself off-line or if it's just their own network connection. Still, the site does periodic downloads of the active logged-in player count from the EVE API. That data was available for download... right up until not long after my post hit. These days, that part of the site says the API data is "temporarily unavailable." That was a bit of a problem because at the end of "Curves", I stated that the trend-line for the average users logged into EVE at that time was on a sharp downward trend and that it'd be interesting to look at it in another month to see if that trend continued or stabilized. Since then, I've gotten numerous requests for an update, an update that's been difficult due to lack of data. Well, in the last few days, I've received the data. This time, I'm going to keep my sources to myself, but I am convinced of their accuracy. Both sources provided me with data, and their data not only tracks with the previous data that I used to build the previous chart, but with each other. I have no reason to suspect at this time that they got their data from the same source, and the data looks consistent, so I'm going to go ahead and run with it. I dropped the new data into the previous spreadsheet that I built for "Curves". I then decided to build a new spreadsheet and normalize the data. This involves taking out the data drop-outs and discrepancies caused by EVE patch days. Instead, I'm going to stick to full 24-hour EVE days where full data is available (with a couple of exceptions here and there). That didn't adjust past math too much, but did make some differences to the 2011 numbers. My updated spreadsheet with the raw data reflecting this is also available if you want to do your own analysis. Don't get too excited over the dramatic-looking curve. Note that the bottom line of the X-axis is 26,000 players logged in, not zero. 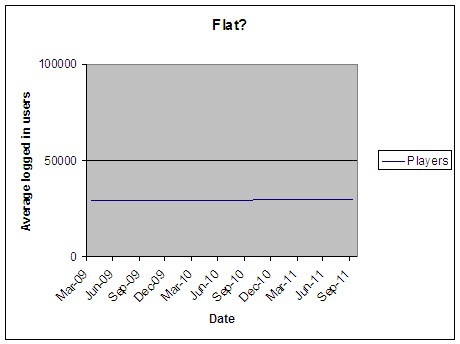 Significant events that have taken place in 2011 are surprisingly easy to see on this graph, I was pleased to see. You can see the typical post-patch dip for both Incursion Phase 3 and the "Sanctum nerf patch" released in the first week of April. Alliance Tournament IX is easy to spot, as are the Jita riots. It was a bit tougher to understand what happened in EVE on March 2 that caused the big spike there, until I started doing incursions myself. After that, it was easy. For those wondering what the percentage in EVE's growth was for +60 days after Incarna's release? Before I normalized it, it was up a bit. After normalization, the true number is -0.2%. The normalized +30 day number changes from the -1.8% I published on July 20 to +0.1%. In short, either there's been no growth from Incarna, or any growth has been neutralized by unsubs caused by this summer's dramas. As a matter of fact, what struck me the most about the new, normalized chart, was the 30-day rolling average for the last 30 months. That number on February 22, 2009: 29,113. The same number on August 22, 2011, 30 months later: 29,841. The short spike of new players after Incursion was released aside, that's a difference of 2.4%. In 30 months. That's not a curve. That's a flat-line. "Stagnant" doesn't even begin to cover this. Bet you money, Hilmar has charts that looks very much like these two on his office wall somewhere, right now. It's got to be one of the biggest things on his mind, if not the biggest. 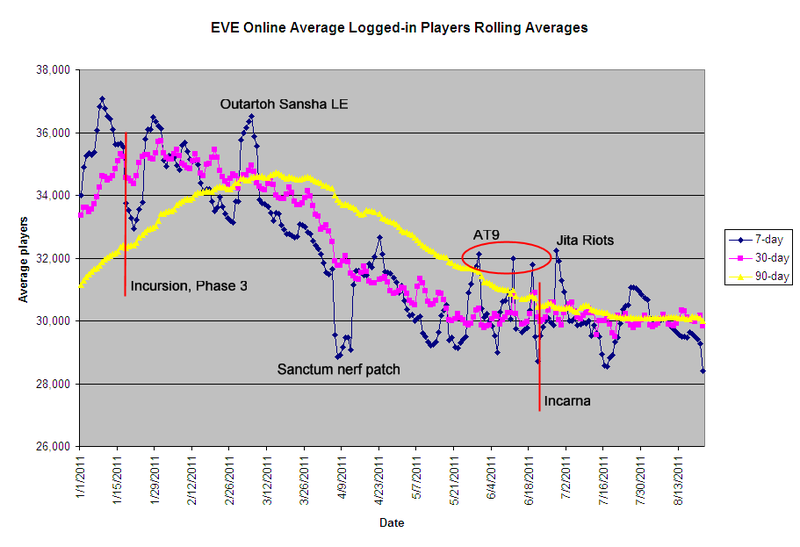 Assuming the big spike in logged-in players after Incursion dropped was old EVE players coming back to check out all the changes and to spend their Learning SPs (something that's implied by a lot of forum posts from the devs, CSM Summit minutes, and other sources), those players seem to have turned right around and left again. Incursion did not draw them back to stay. Incarna is doing nothing to bring them back a second time. I believe even more strongly that the winter expansion is "sink or swim" time for CCP. It must succeed. 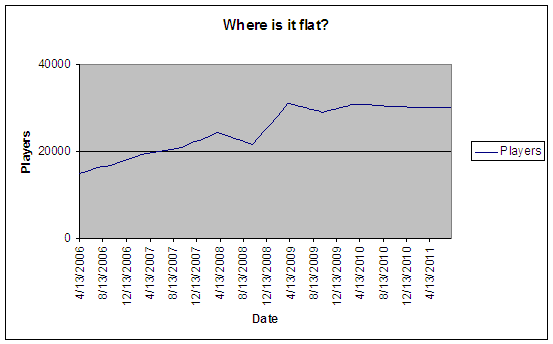 EDIT (31/Aug/2010): Another version, for those who want to accuse me of manipulating the first graph. Same data, going back to the beginning, 30-day rolling average, six month slices. You tell me where it's flat and where it isn't. Again, decide for yourself. But if you want to argue with this one, you might want to join me in a place I call "reality." In 1992, in the midst of the U.S. Presidential race that year, the incumbent candidate, George Bush (Sr.), attended a National Grocers Association convention. "I just took a tour through the exhibits here," he said later. "Amazed by some of the technology." Pundits in the media responded that some of the "technology" that Bush had been amazed by were grocery store bar-code scanners and electronic signature pads. Grocery scanners had been in the U.S. mainstream for about a decade at that point, and were common, everyday items to the vast majority of Americans. But (as the pundits spun it), Bush had been in the White House as President or Vice President for 12 years by that time, and "obviously" wasn't familiar with things that were a part of daily life for most Americans. It (probably) wasn't true. Bush was (probably) very familiar with grocery store scanners. But he came off looking out of touch, and he went on to lose that election. This story has absolutely nothing to do with The Mittani's latest column in Ten Ton Hammer. Go out and give it a read. I'll wait. It's worth your time. You back? Good. I'm going to play the odds here and guess that the column probably confused you a little bit. A good, solid majority of you probably didn't follow what Mittens was trying to say, or perhaps came back a little bored or even insulted by it. To explain the column, I'm going to have to describe what life is like in a fairly typical sov-holding null-sec alliance. If you're familiar with it, you can skip past the italicized section and rejoin me afterward. You log into EVE. You're immediately signed into your alliance's API-controlled private-chat channel (or two, or three). The MOTD reminds you that signing into TeamSpeak is required when you are logged into EVE. The MOTD probably also reminds you that it would be a good idea to get into the alliance's public channel as well. You sign into TS. If you're anybody at all in your alliance, before you logged into EVE, you were also signed into Jabber, Skype, Trillian, or something similar. You're greeted by three or four people as you get into TS. You check the API-controlled intel channel for your region. Nothing immediate seems to be going on. So, you open up a web browser and check the alliance's API-controlled and password-protected forums. There are new posts in the fitting, war, and all-alliance sections. The new fitting post is from the alliance's war-time director, who reminds you that it is a requirement for you to fly the latest FOTM. You are required to change your skill training as needed to fly this ship, and that skill books will be provided for those that can't afford them. He's written a second post urging people (again) to train Cyno V because the alliance needs more covert-cyno capable pilots. In the all-alliance section, there are two new posts. One is a required CTA (call to action or call to arms) for Friday night. It's expected to be a six-hour operation to save another alliance's POS, and if you're logged into EVE, you'd better be there. It might be their POS, but next time it might be ours and we'll want their help. Another post is from the alliance's finance director, reminding you that everyone has to submit either their alliance membership dues or turn in their required PI donations to the appropriate places before the end of the month. 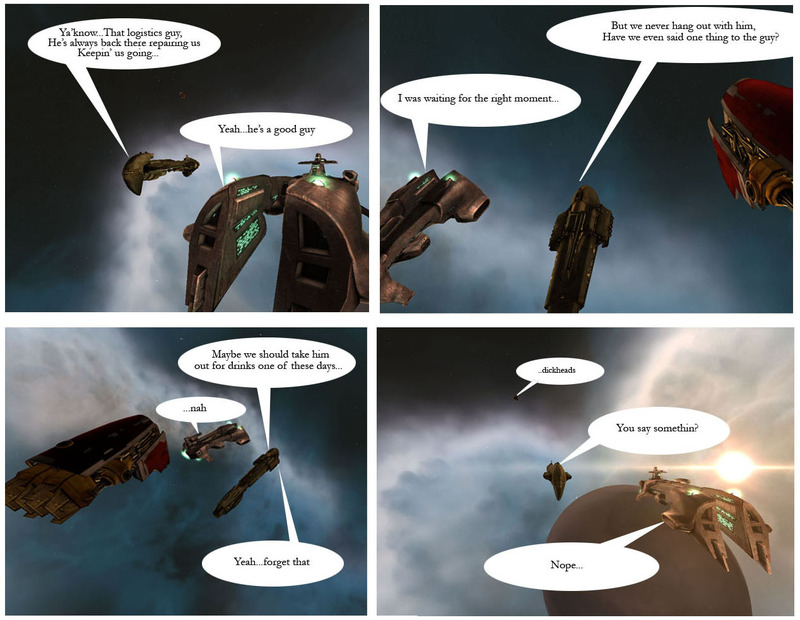 There's another post congratulating the alliance's logi pilots on their work in the latest roam, and reminding everyone that (unlike most ships) Logistics ships are being reimbursed at 100% right now. The war forum is busy! There's six or eight new posts letting everyone know that there will be a deployment starting in a week. All pilots are required to bring at least four ships, and there are detailed lists of ships, mods, and fittings that will be required for the deployment. All command-ship capable pilots are to bring the required four ships, plus at least one command ship of the appropriate type. Logistics pilots should bring the four ships, plus at least two of those. All carrier pilots are required to have their ships fueled and travel-fit by Sunday. Expect a CTA to be called Sunday night for the first of three movement ops. If you're not a carrier pilot, you better have your ships (renamed with your pilot name) moved to your corp's Deployment hangar by Saturday afternoon at the latest. But there will be follow-on ops on Tuesday and Thursday as well for pilots that miss the first one. Deployment is expected to last a month, so do your ratting and ISK up now. As you're reading, TeamSpeak gets busier. Seems that a neutral gang is moving into the region. You check the region's intel channel. Yep, there they are, being tracked as they get closer to where you're docked. One of the alliance's more junior FCs cuts through the chatter. "They're coming our way. Everyone get undocked in a shield BC and meet on the out-gate. C'mon, guys, get out here and let's get some kills. Everyone get undocked. Undock right now! Why are there 24 people in Local and only three people on this gate?" A lot of you are probably wryly laughing and nodding as you read this story. But I'll bet a lot more of you are probably staring at the screen in just a little bit of horror, or maybe congratulating yourself for never joining a null-sec alliance. ;-) I'm playing the odds here because most of you aren't in one. After all, 88% of EVE's characters don't reside in null-sec space. This stuff is a lot of the reason that when Yahtzee's Zero Punctuation reviewed EVE so negatively, one of his comments was "I must be missing the appeal of a second job you have to pay for!" Because for residents of sov-holding null-sec alliances, that's exactly what EVE is: it's a recreation of George Orwell's novel 1984, with you in the Winston Smith role. You follow orders! You do what you're told! You yell in rage at Eurasia, because Oceania has always been at war with Eurasia! Boiled down, Mittens's column basically asks, "If in a typical futuristic science fiction setting, every man can be his own God, why is that not the case in EVE Online?" He spends a lot of time in the column talking about the Stalinist authority that EVE players bow to, and even indirectly invokes a book that a communications expert wrote in the 80s that (among other things) compares 1984 and Brave New World. The picture he paints is of bleak 1984 totalitarianism, objectivist scum destroying all that do not share their world-view, and those too scared to submit pushed away from EVE to other games. There's only one tiny tiny tiny problem with this: 88% of EVE's characters don't live this way. 88% of EVE players are their own authorities. Granted, a lot of those characters are alts for null-sec dwellers, but the large majority of EVE's players have nothing to do with Mittens's 1984 totalitarian world-view of EVE. That's why his column is probably confusing to a lot of you. And those of you that aren't confused are insulted, because the column refers to the other 88% of EVE's populations as "stupid", "victims", or "dupes". Yes! He refers to the people that aren't living in 1984 totalitarianism as "stupid", "victims", or "dupes"! For those that have forgotten, back in late June, CSM6 had an emergency summit with the CCP developers. They were called to Iceland to discuss the massive wave of un-subscriptions hitting CCP's bottom line, and the player riots that took place in Jita, Amarr, and Rens. These unsubs and riots regarded just three of the ten or so self-inflicted wounds that have affected CCP this year: NeX pricing, what would be sold in the NeX, and the "Gordon Gecko" issue of the Fearless internal company newsletter. Shortly after the summit was concluded, a short statement (most of it wasted, as I posted back in July) was released, along with a superior video. Still, we were also promised that there would be a much longer document indicating what specifically had been discussed and decided at that emergency summit. Many of us, including myself, have been pestering CSM6 members about it, to the point where they've stopped talking about... well, about anything, really. The only two CSM member blogs are functionally dead. Other than a half-hearted second fireside chat and Trebor's crowd-sourcing initiative -- during which he frankly did near the absolute bare minimum amount of work to make that initiative happen -- the CSM has also apparently been dead. The total official meeting count of CSM6's term still stands at "one". They've made very few public attempts to reach out to the player community about anything. "It's like all the CSM6 members have been turned into Stepford Delegates," says CSM5 Chair Mynxee on Failheap. Since I am the one responsible for getting the minutes out I'm the guy that is responsible for the delays. It has always been the aim to release any minutes from CCP/CSM meetings with the approval of everyone that participated. Sometimes it is easy, sometimes it is not. When the matters of tone and semantics come up the best way is to simply go through it step by step and resolve the differences. And this takes time. I realize that many are waiting for these minutes, but we want to get this right - it is just the question of finding the right 'right' that all parties can agree to. Specially when the subject is volatile and sensitive. The main point is that we will release these minutes, but we will only release them when all parties have accepted what is being written in the minutes. two step -- alternate delegate to the CSM and currently worth about four full CSM members -- responded to this on FHC, saying "Right now, the issue that *all* of the CSM have with the minutes is that CCP made edits that we don't feel reflect what actually happened at the summit. I'm not sure who you would blame for that, basically it is both of us holding up the minutes release at this point." To this, all I can say is, "FFS". CCP has clearly learned nothing from what happened in June. In the same thread, Mittens is threatening to put away the carrot and get out the stick. Given that's what he campaigned on six months ago, I'd say it's about time for that, yeah. EDIT (30/Aug/2011): Rereading this piece, I come down on Trebor pretty hard, which isn't really my intent. Like Mittens, two step, and (to a lesser extent) White Tree, at least he is doing work for the CSM. Most of the rest of CSM6 appears worthless. Seleene's performance, or lack thereof, is particularly disappointing. Late last week, Kirith Kodachi over at Inner Sanctum brought up World of Tanks and opined that "EVE needs arena PvP. Full stop." Kirith came to this conclusion after trying out World of Tanks apparently after several weeks of resisting hearing corp- and alliance-mates talk about it. Indeed, my last few weeks in LAWN, it was common for the main LAWN TS channel to be dominated by WoT discussions and battles. At that time, there were seemingly more EVE players playing Tanks than EVE, right up to Mittens himself, who is apparently a big fan of the Russian tank tree. From his own play, Kirith came to dislike the idea of modding the client of an MMO PvP game, but to admire the "instant on" nature of PvP combat in WoT. Those who have read my blog for a while may have been able to piece together my opinion of it, despite the fact that there are zero posts on this blog tagged "World of Tanks." In short, I tried WoT myself for a few weeks and came away from it rather ambivalent. While I also loved the instant-on PvP, and I love-love-love the friendly fire, line of sight, and cover systems even more, the pay-to-win aspects of WoT turned me off the game in a big way. The first rule of micro-transactions in PvP-based MMOs, so far as I'm concerned is: don't sell power. The second rule is: let me grind to every item in the game. If your MMO fails those two tests, I'm not going to play it, and that's that. WoT fails those tests. These days, if I want an instant-on PvP fix, I go to Global Agenda to get it. GA currently passes the tests, though it flirts with the lines wherever it can. Siesmic Stan at Freebooted brought up the topic of arena combat himself -- also in favor -- then invited other EVE blogs to do the same. "Flight simulator"/EVE "arcade game". Two pilots pay a bar bet of not less than one million ISK. Then they "sit" at consoles and battle each other on an Alliance Tourney-style EVE grid with pre-defined identically fit, identically player-skilled Rifters/Ruptures/Hurricanes. Winner takes the pot, minus a percentage for the house. I also said that others should be allowed to bet on the outcome. This was just a short note, that I'd like to expand on, in story-board form. You enter an Establishment in Jita. You've been challenged to a 1v1 PvP fight. In the old days, this would have involved a trip to an agreed-upon low-sec system, or a can-flip outside the station, or riding down the acceleration gate of a L1 mission. But players figured out the exploits to take advantage of these things long ago, and 1v1 PvP is all but dead in EVE... except in the bars. Besides, you've been playing since 2007 and have 75 million skill points. Your opponent is less than a year old. He doesn't think you're as good as you say you are, and he's willing to put 100 million ISK on it. That's good enough money to draw you to Jita. You drop from your pod, suit up in your default Incarna clothes -- the NeX isn't for you -- and pass through the Door into the Jita Main Bazaar. You grimace. It's as crowded as when you first visited, two years ago. Still... let's get this over with. You move down the Bazaar ignoring all of the player-built clothes and jewelry and ship skins and enter a small Establishment called Pounders. It's run by one of the new wave of NeX billionaires, who made his money selling red high-heels to the masses, but he's not a bad guy for all that. He pumped his billions into buying the BPOs for, and building, a series of Consoles. The Consoles are the game grid of EVE... the virtual world layered on the virtual world. There's the SecWars Consoles, and the Chess Consoles, and the Living Chess Consoles, and the DUST 514 Infantry Combat Consoles. You pass them all by. 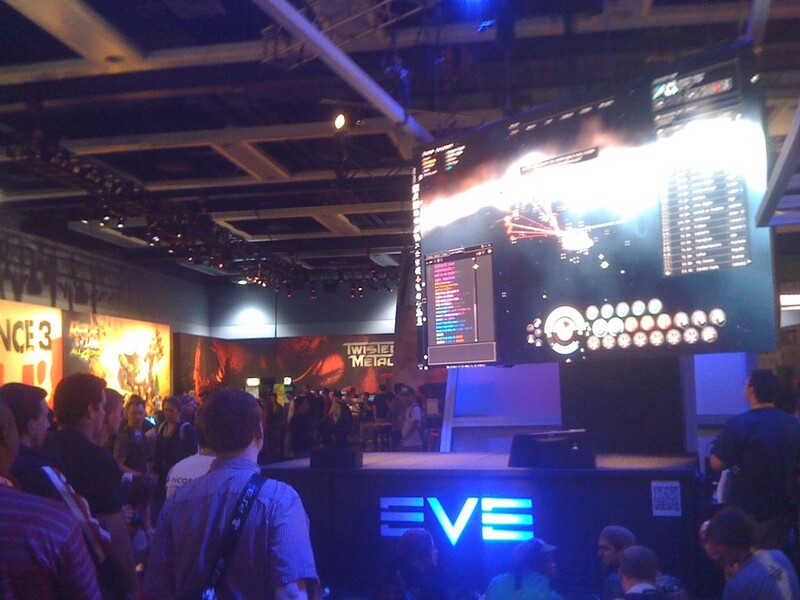 In the back are the EVE Arena Combat Consoles. Each one is a masterpiece, costing over a billion ISK to build from materials gathered from all over New Eden. Pounders has six of them, all two-seaters. The four-seater version is six billion. Pounders hasn't put one in yet. Your opponent has already claimed the second one to the left. He's garishly dressed, but you ignore that. It's beneath you. The terms of the combat are set: 100 million ISK buy-in from each of you, identical ships, identical stats, winner takes 90%, house takes 10%. He's specified Rifters in 15 million SP characters. You accept those terms and have a seat. Behind you, you can hear the side-bets being made, and there are lots of them. You accept a few of them yourself, betting on yourself, of course. Pounders will be taking 10% of all of that money too... it'll be a good night for the owner. Someone else says that they'll put in a 250 million ISK stake to fight the winner, same conditions as this fight. You let him know that if you win, you'll be happy to take him up on that... if he doubles the stakes. He agrees. The Console activates, specifying your choices: standardized ships from Rifters to Sleipnirs to the newest wave of Tech3 battleships. You select a standardized 1v1 Rifter build. It's one of the few choices not greyed out... the standardized game grid character your opponent has specified only has 15 million SP, after all. You accept the ship as presented. Off in the Market, the parts to build it are purchased and transferred to the grid. It's automatically fit for you. The game specifies that you'll have ten minutes to destroy your opponent. A moment later, you're on the grid. I think it's a means to bring Arena combat to EVE that has a lot of merit. It creates skill-against-skill fights, brings "instant-on" PvP to EVE in a way that isn't game-breaking, and doesn't hurt the Market the way a lot of arena proposals I've seen do. As I mentioned on Twitter Sunday night, I spent most of this past weekend incursioning, including flying in the low-sec mom fleet that I mentioned in my previous post. 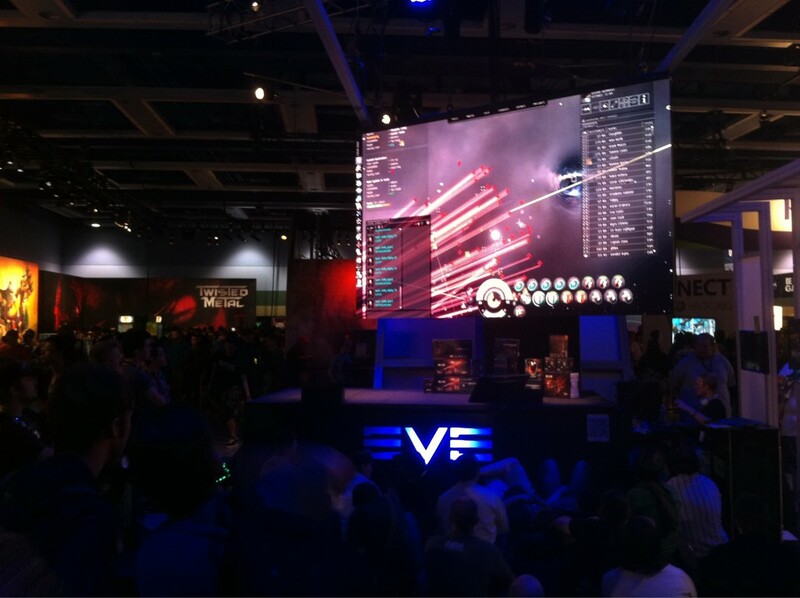 But PAX, the Penny Arcade gaming convention, was also happening this weekend, and CCP Dropbear and CCP TonyG were there (among others from CCP) to demonstrate EVE to convention-goers. there's no ISK reward for participation... just fun and bragging rights. As a result, there's a somewhat different crowd that goes in for live events, normally. You see a lot of veteran players and veteran role-players, having fun with that aspect of the game. I myself don't have a huge amount of interest in it, but I wish those that do well. Still, when it was announced that there would be a live event during PAX displayed for PAX attendees on a big screen in the EVE booth, I decided "what the hell" and decided to participate. Rather than taking one of my expensive Basilisks, I jumped into a cheap PvP Scimi fit, got into one of the response fleets, and headed for Jita, where the response fleet was forming up. Pretty cool, I thought. It was fun to see a lot of interested people there. It made me wish PAX takes place a little closer to where I live. Ah well. Anyway, the FC was on our fleet voice comms, going into tactics that would be needed to take out this particular version of the Sansha mothership, including tactics that would have to change if it had smart-bombs or neuts fitted. "It does," I reported on comms. "CCP TonyG just tweeted a picture. It's got five smart-bombs and two reppers fitted," I said, then linked the picture. "Well, that answers that, then," the FC said, amused. Before too long, we were in New Caldari with the mom. Fortunately, it was just off the Jita gate in New Caldari. I happen to have a couple of observation bookmarks around that gate. 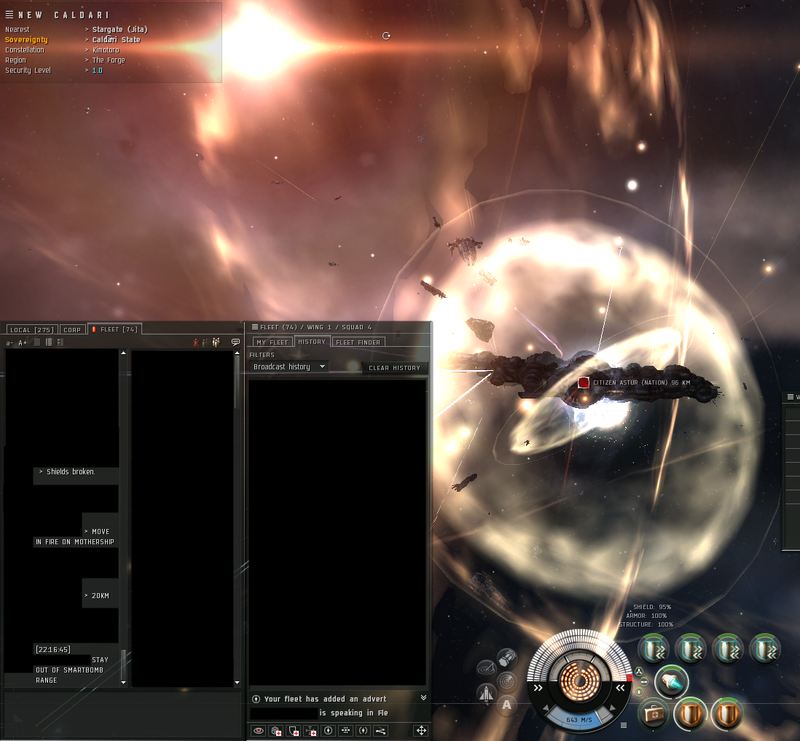 Here's a screen shot from my EVE client. I had just warped off to one of my safes to avoid a spawn of Sansha battleships that decided my Scimi would make a good target to aggress on. Overall, a pretty easy fight! There were about 70 in our response fleet, and a few hundred responders overall. A few people in our fleet would get aggressed, but more often than not, they'd warp off before any of the fleet's logi, including myself, could rep them. I didn't bother bringing damage drones, both because of the smart-bombs and because I don't consider an LE kill a "real" kill-mail. And there was almost no role-playing involved this time. I'm told usually, the role-playing is very extensive. 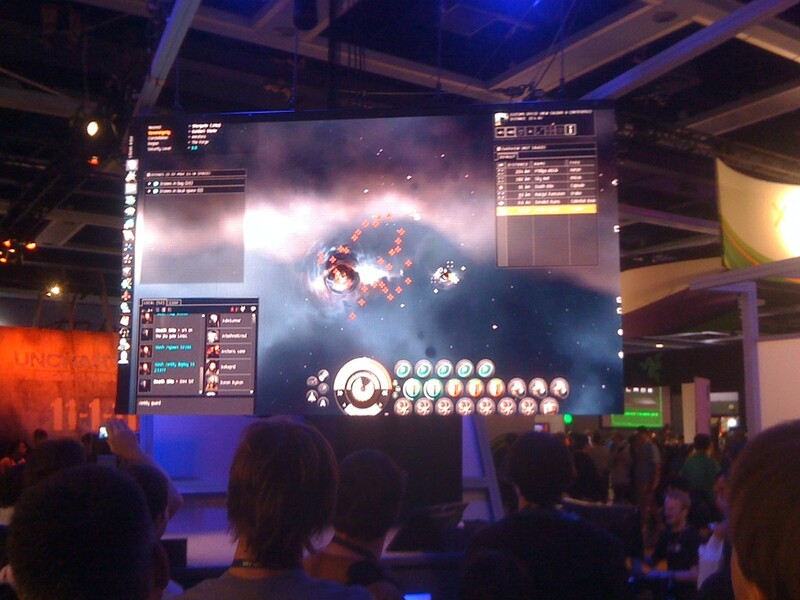 As this was a demo for the PAX crowd, the lack of this component wasn't particularly surprising. CCP Dropbear thanked us for participating, then announced on Twitter that the event would be repeated the next day, Sunday. I passed this along to the official incursion channels. That said, I was prepping for the low-sec mom when this picture was taken, and didn't participate in the second day's LE. All in all, the Saturday LE was an amusing diversion, but nothing I have a strong need to do again. EDIT (29/Aug/2011): Orakkus, below, has the source. Thanks! The comic above is comic #3 of the set. Damn, is this really a good idea? I've been in a grand total of one incursion mom fleet. And yet I've volunteered for the most dangerous incursion job there is: going into low-sec to take out a low-sec incursion mom. That would be dumb enough. But I'm volunteering to do it in a Basilisk, which means I've volunteered for the most dangerous job there is in the most dangerous incursion job there is. More Basilisks have died in low-sec mom fleets -- by far -- than any other ship. The FC is being very frank: a lot of logis are going to die. But I can handle this, right? I'm a hardened, experienced PvP pilot with more than a thousand kills. I've done solo PvP work across New Eden. I've scouted for roaming fleets. I've been doomsdayed. I've PvPed in a two billion ISK carrier, and a billion ISK Tengu. I don't freak out, I don't freeze up, and I don't rattle. I've got near-max skills for this, and since it's low-sec, I drop into my PvP clone, the one with all of the PvP fleet logi implants: more shields, more armor, more speed, more cap. That clone is already in low-sec, in the station with my triage carrier. I miss my triage carrier. Wish I could bring it for this. If I'm going to do this, I'm going to go all-in. I break out one of my spare Basilisks, and put Ripard in the driver's seat. I won't bring the second Basi into the site, but I'll bring it with the fleet, safe it up and log it out when we reach the mom system, and use it as a hot standby. If my main logi pilot gets his ship killed, Ripard will log in, abandon the second Basi at the safe spot, and get back to high-sec while my main logi pilot gets back into the fight. The fleet forms... and forms... and forms. More than an hour passes. I'm chatting with an old alliance mate of mine from LAWN, also in fleet (in a Tempest). Like me, he's an adept PvPer. I compare waiting for a low-sec incursion fleet to form to waiting in POS warfare. He retorts that this is worse. At least with POS warfare, you have a timer and you know when the fleet has to depart by. I concede the point. There are hundreds of people in BTL PUB, but only a small fraction of them want to go into low-sec. It takes 65 people, minimum, to successfully take out a mom. At least 15 of them have to be logis. And 65 and 15 are the bare minimums. Better totals are 75 and 20, respectively. But despite bringing in hundreds of millions of ISK per month -- if not billions -- almost none of these high-sec bears want to go into low-sec, even if they have a fleet of 65 or 70 people around them. The urge to call them names rises. I damp it down. I'm a mutant, after all. I hope we get a PvP fight on the way there, or on the way back. That, I know how to handle. It makes me almost ridiculously atypical among my few fellow logi pilots, though, so I keep my mouth shut. Another hour passes. The fleet size can't seem to get out of the 50s. We pick up a few, we lose a few, we pick up a few, we lose a few. My old alliance mate calls in some of his current alliance-mates, PvPers all. They get into fleet and push us into the 60s. That breaks the log-jam. Our logi count is coming up short, but some of our DPS pilots reluctantly switch. The final fleet that departs our staging system is 71 people. 15 or 16 of us are logis: nine-ish Basilisks and six-ish Scimitars. We're going to try to take on the low-sec mom with the bare minimum number of Logistics ships and only just over the bare minimum total pilots. In an incursion, there's a bar that indicates how much control the Sansha have over a constellation. The bar controls, among other things, how much your various ship resistances are nerfed. In an high-sec incursion, so many pilots have done so many sites that by the time the mom is confronted to end the incursion, this bar is always 100% blue: no impact on capsuleer ship resistances. That won't be the case this time. Our fleet scouts report that the bar in the mom system is 72% red: our ship's resistances are going to be greatly reduced. Sansha moms kill Basilisks just fine in 100% blue systems. Why the hell am I doing this again? The scouts also report that the four low-sec systems we'll be passing through are all very quiet. This seems to settle down a lot of the high-sec bears in the fleet. There will be no PvP. We reach the mom system without incident. I check my Basi's EHP as reported in-game: 46k EHP. I wince. With fleet boosts and this fit, I'm used to seeing a number in the 60s. Before I've even had a chance to think that through... we're in the site. My EVE screen is 1200 pixels high. The overview takes almost all of this down the right-hand side. It's full of red crosses. Most of them are battleships. I scroll some. It's still full. There's almost two pages of hostiles on grid with us. And the Tama bomber spawns and Lirsautton fighter-bomber spawns haven't even started yet. The Lirsautton Parachiya is the Basi-killer. They represent fighter-bombers launching from the Sansha mom. They almost always aggress on Logistics ships. A spawn of them does about 12000 shield damage to a cruiser-sized ship. It's enough to take most Basis out. There's only one Basi fit that's proven to be able to be able to survive it, and that's the fit I'm in. And the Sansha mom doesn't get only 20 of those and then empty... oh no. She'll be spawning 10 of them at intervals for as long as she's on the field, or so I learned from the high-sec mom fleet I was in. The FC orders everyone in the fleet to keep an eye out for them, and declare them on comms if they're seen. I get my cap chain up and get to work. Requests for shields are coming in thick and fast. I have all my fellow Basis, plus my anchor, on watch list. That's ten ships. But I'm also keeping an eye on a Dramiel in fleet. I don't understand how this works, but he'll apparently be hacking a site on grid that causes all the enemy ships to warp away periodically. I don't know how he's doing this, but I approve of it heartily, so I keep him locked so he'll live to keep doing it. At first, the site goes smoothly. The FC calls targets, they disappear, the FC calls new targets. I can ignore all of this. My focus is on the Broadcast History. Get locked onto aggressed targets, keep them alive. A couple of people, including a Basi, dip into armor or hull. That resist nerf is tearing us up. But we save them and the Sansha move on. A few of the Scimis brought armor bots and put them to work. Good show, Scimis! The first fighter-bomber spawn appears. A Basi calls for reps... I start to lock hi-- his cap buddies report he's gone. I never got him locked. He shows up on my watch list as having nearly full shields, but that's just his pod. He warps off. He's on the opposite side of the cap chain from me so I don't have to adjust. Other Basis do, and they get it done successfully. It clears a space on my watch list, though, so I add the Dram to bring it back up to ten. Now I can find the Dram quickly to lock him when I get jammed. Someone abandons all of the wrecks the fleet has created so far. Abandoning wrecks is something that you can do in PvE sites. It allows anyone to loot or salvage them. In a mom site, though, it's a griefer move. The database inventory system has to adjust all the wrecks on grid, and this action seems to have priority over everything else. It causes a huge lag spike for the entire fleet that lasts for a good ten or twelve seconds. When things go back to normal, all the wrecks are blue. And one of my cap chain partners is gone. He got aggressed during the lag spike and nobody could activate rep mods to keep him alive or even see he was being hit. Six Basis left, and there's a confirmed griefer in fleet. This time I have to adjust. I find my new cap partner and get him locked and cap transfered. The FC is yelling at the unknown griefer before calming down. He resolves to abandon the wrecks himself a few at a time for the rest of the site to keep that from happening again. I sign into EVE on the Ripard client, enter the password, but stop at the log-in screen, then minimize it again. Just in case. I'm now ready to log him in at a moment's notice. ...which it does again. When I get locks back, one of my cap partners is a pod. I stupidly send him a cycle of cap before realizing and adjusting. Another Basi dies less than a minute later. Four Basis left. A moment later, the Dram disappears. I hear word over fleet chatter that he might have been destroyed. I secretly hope he warped off. I can see Scimis doing this occasionally when they get aggressed. They have that luxury, and their thin tanks make it a requirement. My fellow Basi pilots and myself don't have this freedom with the cap chain up. The Dram returns. Either he warped off or he wasn't the only person who put a hot standby ship in system. Enough Basis have died that I add the Scimis to my watch list to fill it back up. He disappears. Not damaged, not into armor. Just gone. This pilot had been bragging about his fit earlier. I look at the logistics chat channel, searching for my new partner. Dead-dead-gone-dead-gone-dea-- there's only two Basis left, including me! Somewhere along the way, I miscounted! A chill goes through me. There's only one other Basi left. Seven, maybe eight logis total on field. I get him locked up. We haven't traded logi skills, so I have no idea if he's Logistics IV or V. I don't risk it and send him both my transfers. My cap display soon confirms he's doing the same. I frantically get on fleet chat and ask for a battleship with a energy transfer to be my backup partner, and a Machariel X's up. "I'm your new anchor!" I tell him. I watch him slide into range. The FC tells the other Basi to do the same, but either he's not on voice or he's too busy. Nothing appears in fleet chat. Maybe he's got a corp mate doing this for him already. I hope so. The fighter-bomber spawn is killed. I get back to work. The rep requests are almost constant now. There's hardly any time to Ctrl-click on one before two more are in its place. The mom is down to about 40% shields, the FC says. I don't have time to think about it. There's only the constant cycle of rep, get the target up to 90% shields or so, get two or three new targets, rep those, clear locks on old targets, repeat repeat repeat. It's the hardest work I've ever done as a Logistics pilot, bar none. The Dram pilot reports it's a little over a minute before he can do his magic and make the Sansha go away for a while. A new bomber spawn appears... and yellow boxes appear around them. This is no time to be polite. I get on voice comms while simultaneously hitting my rep request broadcast hot-key. "Check! ", I yell, then name myself, then "Basi, bomber spawn, aggressed!" One of my tricks as a PvP pilot is to alternate the arrangement of active and passive mods in my racks to help with overheating. My mids are: hardener-LSE-hardener-LSE-hardener. The LSEs take a pounding, but it keeps the hardeners overheating longer. I hit the "overheat rack" button for the mids. "Warp off!" the FC orders. I look at my current rep targets. Machariel, 2 reppers. 33% shields. Tengu, 2 reppers. 50% shields. I've got the safespot bookmark right in the middle of my screen in its own dialog box. I right click, hit "Align to". Out of the corner of my eye, I can see about half of the rest of the Sansha fleet taking this opportunity to red-box me as well. But if I leave... the other Basi has no visible cap partner. That takes two logis out of play. The crew-voice in my head is yelling at me: warp warp warp! On my watch list, I see a Scimitar disappear. Either killed or warped off, probably the latter. That tears it. If I leave, five logis on grid, and a fighter-bomber spawn on the field. If I warp off, the fleet is down three logis for a minute at least. If I get killed, I've got a hot standby that I can come back in... same difference either way. I can feel my jaw muscles clench. NO, the Captain-voice in my head says. We. Stay. Here! The first volley of torpedoes hits. Shields, 10%, armor bleed. Back to full. 50%. Back to full. 30%. Back to full. 20%. Back to full. 5%, more armor bleed, back to full. I'm... tanking it. The combination of a perfect fit, overheated hardeners, high transversal, PvP implants... it's somehow keeping me alive. The fury of at least two-thirds of the on-grid Sansha fleet is pounding on my Basilisk. If I were to zoom in, I'd bet the show would be spectacular. Only later does it occur to me that this would have been a good time to do so and hit the "Screen Capture" key. For now, I don't have time. The reppers in my high slots are sorted almost randomly with my cap transfers. I know from experience I can overheat three of the reppers safely. Now's the time. My adrenaline level couldn't be any higher. I get the Mach and Tengu repped back up, then in groups of four, lock up the last sixteen people to call for reps. Haffa's line from Clear Skies 2 goes through my head... "While they shoot at me, they don't shoot at you." I can almost feel the screaming fury of the Sansha fleet outside. The combination of boosts and overheating makes the reppers spin. The Broadcast History goes eeriely silent for the first time in at least the last ten minutes. Rep each target, get them back above 90%. I don't even bother shutting off reppers. The FC is saying stuff that I can't hear. Just unlock repped targets and let that shut the reppers off for me. Move to the next, and then next, and the next. Lock the next group of four. Soon, all sixteen are repped. I look up. The remaining fighter-bombers have yellow boxes around them. My Basi is still here. I'm still here. I hurriedly turn off the overheating. Everything is at least 50% red. I click "In Position" to let the other logis know I'm OK. The FC calls me by name. "How you doing?" he asks. "I overheated hardeners and tanked it. I'm still here!" I reply. "Good job!" he says, then gets back to work. Similar compliments in the logi channel. A few seconds later, the Dram pilot does his magic and most of the Sansha warp off. It's just the mom and a few support cruisers. "EVERYTHING YOU'VE GOT ON TAG X," the FC says, giving the mom's tag. A moment later, it's in armor. It's not over yet... but yeah. It is. It's over. Sansha ships are shield-tankers. A couple more minutes of pretty lights, and 90 million ISK flows into my wallet. I'd say I earned it on this one. Final count: seven Basis out of nine killed. No other losses. No other losses. Cap-stable for no reason? Check. Not using cheap faction crystals to increase DPS? Check. Carrying Radio and Standard crystals despite being afterburner-fit? Check. Tractor beam to pull in wrecks with tags worth a couple thousand ISK? Check. Using two T1 rigs where one T2 rig will do the same job? Check. Idiot at the wheel? Check check. I would believe this KM was a troll if it were not API verified. This document continues from Part 1 of the Introduction to Incursions guide I wrote yesterday. If you haven't read Part 1, you should do so before continuing on to this one. This next "step" isn't a step at all so much as it will be a constant journey. This isn't a ship that's going to blow the doors off anyone, but it's well-fit and ready to enter incursion sites. It'll do just fine all the way up to HQ sites as long as you learn when to broadcast for reps. It'll probably even do well in a mothership site. With a good pilot aboard, it hits the suggested 750 DPS mark with room to spare, and the fitting shows that you've put some thought into what your role is and how you'll fulfill it. It's not particularly skill-intensive, and it's not particularly expensive. You even invested in some faction ammo. As I mentioned a few posts ago, the most efficient sites in terms of making ISK are the 10-man Vanguard sites. You find yourself being invited to a few Vanguards here and there, but you're competing in the same turret DPS category with Nightmares and Machariels. You set your sights on a Machariel as a long-term goal. It uses the same heavy projectile weapons you're already somewhat skilled in. But it's an expensive ship: anywhere from 850 million to a billion ISK for the hull alone. You're being picked up for incursion fleets occasionally in your Tempest, but not often enough that you're going to be in the Machariel any time before your next birthday. What are the interim steps that will help you get picked up faster and more often? That's where a little bit of bling comes in. You want to pimp out your ship some, particularly in ways that help the fleet. And done correctly, pimping out your ship can be done in such a way that it's actually an investment in your future goals. For T1 ships, look at your ship in much the same way as you would an L4 mission boat. When and if you were solo'ing L4s, you bought upgrades that helped you with that process, right? Incursions are no different. Start by plotting out your mid- and long-term ship goals. If you want to go from Tempest to Machariel, it's a good idea to plan an interim step or two. You can go with a Maelstrom, or take the faction route instead and go for a Tempest Fleet Issue. Let's suppose you're a Clear Skies fan and decide on the latter route. The TFI tanks much better than the base Tempest, and has much the same stats. You can peel off your LSE2 -- the TFI tanks just fine without it. That opens up a mid slot. The TFI also has one more low slot than the base Tempest. This gives you the opportunity to add a third Tracking Enhancer, or a fourth Gyrostab. You also pick up 25m3 of additional drone space. You can fill that with the mining drones that are needed by one Vanguard site. Now start upgrading mods. The open mid slot is a good place to start. Find a relative inexpensive faction webber and put that into the slot vacated by the LSE2. A Shadow Serpentis web is a good choice. It's not the best, but you're not a dedicated web platform and you're saving for your Machariel. But it shows that you recognize what a Vanguard fleet's challenges are and you want to help. As you continue to build up ISK, next, invest in some faction Gyrostabs. A set of three will cost around 250-275 million, but are mods that you can carry with you from ship to ship. They add about 40 DPS and the Machariel you're planning on will love them. They're also a good investment; faction damage mods retain their value very well if you ever want to sell them. Your thermal resistance is right at 70%, so another good investment is a Tech2 Large Anti-Thermal Screen Reinforcer. Not only does this increase your resistance by 2%, training for Shield Rigging IV reduces the penalty for your shield rigs, lowers your signature radius, and reduces the overall damage you take. Next, get busy training for those Tech2 guns! A lot of FCs won't take you seriously as a battleship pilot until you're using them. In the meantime, you can also invest in a set of faction weapons if you like. This is particularly popular for those on the Raven track; Caldari Navy Cruise Missile Launchers are quite effective. As your weapon skills improve, you'll find that the third Tracking Enhancer becomes less necessary and you can replace it with a fourth, non-faction Gyrostab. You're fast approaching 1000 DPS! By this point, you should be getting picked up much more frequently. You're not a Mach (yet), but you pump out very solid damage. Even better, your faction mods can follow you to your Mach and you're not going to have any trouble at all selling your TFI to another up-and-coming incursioner. It'll even draw a premium with the T2 rig pre-fit. This slow-and-steady upgrading of your incursion ship (or ships) is going to quickly become a focus point if you're at all serious about running incursions as an ISK source. The more pimped out your ship, the more frequently you'll get picked by FCs, which in turn will give you a solid cashflow that you can use to further pimp out your ship. Best of all, none of the ISK you've spent along the way is wasted. All of it builds toward your ultimate goal, and once you're within a few hundred million of the Mach, you can sell the TFI to make up the difference. Each class ship has this same progression. Raven pilots should slowly upgrade their T1 Raven but have an eye toward moving into a RNI or Scorpion Navy Issue, or perhaps even a Nightmare (which uses Caldari Battleship skill). They will be purchsing the same T2 large rig and webber, but will pimp out their ship with faction Ballistic Control Systems or perhaps faction Cruise Missile Launchers. They may also go for a faction Target Painter. Tengu pilots will soon want faction Ballistic Control Systems as well. Loki pilots will go for the best faction webs they can afford followed by faction Gyrostabs. And so on. In general, when upgrading, you'll want to balance our ISK outlays to both a) improve your chances of being picked by an FC, and b) make the fleet that you're a part of better. Some pilots will choose to pimp out their defenses, and this is also valid, though less valuable to the fleet as a whole. If you are having CPU fitting problems, it can often help to fit a Dread Guristas Photon Scattering Field, for instance, which uses much less CPU than the T2 version (faction damage mods will also help with fitting issues, since they also use less CPU). Pilots looking to improve their sig radius might go for a faction LSE, or Tech2 Core Defence Field Extenders. Particularly well-off pilots might even fit a Dread Guristas or Caldari Navy Invulnerability Field. If the only bling on your ship applies to your own defense, though, don't expect the FC to be impressed! While your defense means you won't die as easily, these upgrades aren't helping the fleet do its job. And of course, dead-space modules can be substituted for faction modules when desired. I'd caution against advertising too heavily that you have them fit, though! It's perfectly acceptable to claim to be using a faction module when it's actually dead-space. While advertising your ship as better than it is is unethical and risks you getting banned from the official incursion channels, advertising your ship as worse than it actually is is acceptable, to reduce the risk of griefing or suicide ganks. Step 5: Oooh! Pick me! Pick me! Your next step is to be to get picked up by a fleet. To do that, you're going to have to be in the right place. The main in-game shield fleet channel is BTL PUB. Join that channel as soon as you've decided to get into incursions. The first thing that you'll notice is the channel's message of the day (MOTD) which will tell you which incursion is the channel's "focus"... in other words, the constellation that you'll want to travel to. Get your ship into that constellation. You're also going to need extra cargo, so either cargo-fit your ship temporarily with Expanded Cargohold mods in the lows, or use a second account in a hauler or Orca to bring the extra cargo you'll be needing. That cargo is extra faction ammo, extra standard ammo, extra drones, Nanite Repair Paste, extra modules, an afterburner appropriate to your ship's size, and more extra ammo. Incursions are sometimes rather distant from the inexpensive market hubs. If you get into a fleet and really get to burning ammo, you don't want to be forced into a choice between over-priced incursion market ammo and a dozen or more jumps to get to the closest non-incursion market. Pilots will link their ship fittings so that you can click them and see how they're fit. Smart pilots will advertise themselves by location and their ship's role, not its name. Unless your ship name is exceptionally clever and will demand people click on it to find out what it does, you're best served by advertising your ship based on its role and something unique about it. For instance, I advertise my Basilisk under the name "Logi5 VG RSebo Basi". That says in very few characters what I'm looking for (Vanguards), what I'm flying (Basilisk), and something interesting I bring to the table (Logistics V skill and a Remote Sensor Booster). All I have to add is the region that I'm in to my advertisement and I'm done. So, get into EVE's fitting screen, and save your ship fitting. Before clicking the "Save" button, change the name to the new name you've chosen. Then, all you need to do to advertise yourself is to drag that ship fitting name into the channel, add a the appropriate acronyms if needed, and indicate where you are. Don't bother doing it if you're not going to link your ship fitting. FCs won't pick you up unless they can see what they're getting. As noted above, don't lie, unless it's to make your ship worse than it actually is (to avoid griefers). If you get suggestions on how to improve your fitting, particularly if you hear the same suggestions over and over again, heed them! Chances are, the people giving you those suggestions know what they're talking about. Don't spam! Posting your fleet every five minutes or so is about right. Anything more often is annoying and will actually reduce your chances of being picked up. If you're picked up, it'll probably be in the first 30-45 seconds after you post your fitting. You will appear in the fleet chat after accepting the fleet invitation. First priority, find out what exact system the fleet is in. Someone will probably link it right in fleet so you can Set Destination. If they don't, just ask "System?" Second thing, get on EVE Voice. The FC will be issuing audible orders over EVE voice and general fleet chit-chat will happen on that venue as well. It's not completely necessary to have a headset for incursion fleets, but having headphones or a set of speakers is more or less vital. As you approach the fleet's system, you will almost certainly hear them running a site. You've probably been chosen to replace one of the fleet's existing ships. Typically, you'll want to warp to the system you've been linked, then warp to planet one. Alternately, you might be aksed to warp directly to the FC if the fleet is between sites or is still picking up members. While some FCs may broadcast targets, most will expect you to follow tags. I've written an entire guide on tags alone that you should definitely read. Still, I'll include some of the basics in this guide. "Full Fleet" tags, 0 and 1, represent targets that the FC or tagger has designated for all available DPS. This means that DPS ships and sniper ships will both attack targets with these tags. The drone FC (if your fleet is using one) will also attack these targets. In addition, any time that a target is tagged 0 or 1, no matter your role and what you are attacking, you will shift your fire to the newly-designated 0 or 1 tag. This will most often happen when a new spawn enters the field. Remember to broadcast for reps if you need them. In Vanguards, the proper time to do this is as soon as you see yourself red-boxed by the Sansha. In Assaults and HQs, the proper time to do this is as soon as you see yourself yellow-boxed. These higher-level sites produce much more alpha volley damage and if you wait for that damage to hit you to broadcast, the logistics will be starting your reps with you already bleeding shields heavily... not a position that anyone wants to be in. Also, make sure that your broadcast setting is set such that broadcasts will be sent to everyone. This is the small box in the bottom right corner of the Fleet display. Make sure it's showing a cross made of arrows. It's also a good idea to watch the Fleet Broadcast History. The FC will quite often broadcast align points or warp-off points, particularly between sites. Finally, now that you have the basics, feel free to read the full BTL PUB incursion guide! You can find it at the BTL Incursion Guide. That concludes part 2. Part 3 will discuss the differences that are needed for armor fleets in incursions. Part 4 will wrap up with a detailed discussion of being a logistics ship in an incursion. This time, all the nano in the world wasn't enough. Sometimes, you have to move something expensive. And when it's blueprints, a nano-fit stealth bomber is the ideal choice. 99.8% of the time, you'll be perfectly fine, even in null-sec. Nano-bombers are almost impossible to catch if they don't want to be caught. I prefer Hounds for this work myself (given that they're already the quickest of the bombers, and can be nano'ed even further). I had to move some of my own blueprints recently and a nano-fit Hound was what I used to do it. Still, there's nothing wrong with the Manti for this job. Still, that is and should remain Plan B. Plan A is sneaking through gates with a cloak, the fastest align time and the quickest warp-off possible, which this fit should have been able to provide. This kill-mail is proof that it can do the job. Had the bomber fit an ECM or two, though, the crappy sensors of the Ranis would have been quickly overwhelmed and this pilot would probably still have his blueprints right now. So, learn from this guy's mistake, and always have a Plan B.
Incursions are the latest, and best source of PvE income in EVE Online. Still, the hardest thing about incursions is knowing how to get started. Incursions combine elements of PvE and PvP flying, and require somewhat specialized ships to do well. While there are incursion-specific in-game channels, they have etiquette and other knowledge that you'll be expected to know... and damned few teachers. So, if you're starting from square one, how do you get started? The purpose to this guide is to help you take those first few steps into incursioning. You might decide you like it. You might decide it's not for you. But at least you'll start from a position of understanding how things work and why things are the way they are. Incursions are not for beginner EVE players! They require expensive ships, good weapon and fitting skills, and a disciplined play style. Incursions often cost beginners ships that they can't afford to lose for these reasons. If you're just starting out, you're better served choosing a less-demanding PvE option. If you insist on running incursions anyway, then you'd better have understanding friends ready to look after you and keep things from going south. The first thing you're going to need to run incursions is an incursion-capable ship. Not any old ship in your hangar will do, and your PvE ships -- surprisingly -- will probably be the least effective of all. You can't just break out your L4 battleship here and call it good. Incursions reward a PvP-based fitting style, not a PvE-based one. For simplicity, the remainder of this guide is going to assume that you're going to use a shield-tanking ship. This is for two reasons: first, most pilots will be more familiar with shield-tanking, particularly for PvE. Second, there are more shield-tanking FCs running incursions in the official channels, so your chances of being picked up for an incursion fleet will be increased in a shield-tanking ship. Still, a lot of the advice in this guide applies to armor-tanking ships as well. Getting picked up for an incursion fleet is going to be the focus here. You want to maximize your chances of an incursion FC picking you to be part of his or her fleet. Your ship or your fitting might be perfectly acceptable to you, but if it's not acceptable to the FC, you're going to be sitting there docked staring lovingly at your ship fitting instead of making ISKies. So, swallow your pride and fit for the good of the fleet, not for your own self-aggrandizement. This is the hardest lesson for a new incursioner to learn, so the faster you learn it, the better. Your job in the investment phase is to set things up so that when you join the incursion channel and advertise yourself, you get picked for a fleet as quickly and efficiently as possible. Logistics: Basilisk with Logistics V skill, Scimitar with Logistics V skill, Basilisk with Logistics IV skill. Dedicated webber: Loki, Vindicator, Bhaalgorn. Turret DPS: Nightmare, Machariel, Sleipnir, Maelstrom. Quick missile DPS: Tengu, Nighthawk. Snipers: Nightmare, Maelstrom, Rokh, Raven Navy Issue. Slow missile DPS: Raven Navy Issue, Scorpion Navy Issue. The ships listed are examples, and ideals of each role. From this list of ships, you will quickly surmise that there aren't a lot of inexpensive ships on it. And indeed -- in general -- the more ISK you spend on your incursion ship, the more likely it is that you're going to get picked up for a fleet. That's why Step 1 is called "Investment." Any means of making a lot of ISK in EVE starts with this initial investment of ISK to build from. As a rule, you should not think about getting into incursions unless you're willing to invest at least 500 million ISK in it. You can get into incursions with less, but you will not be picked for fleets as often. You'd better hope to make friends who will take pity on you in short order if you're not going to invest in this activity. For instance, an inexpensive Hurricane is an example of "turret DPS", but if an FC has a choice between your Hurricane and a flock of Nightmares, Machariels, and Sleipnirs, guess who is going to get chosen and who is not? One more thing: for many FCs, "turret DPS" only counts if that DPS can be applied at ranges of between 14 and 24 kilometers, the range a typical incursion rat orbits at. For this reason, many FCs eschew blaster-fit ships unless those ships are exceptionally quick. Vindicators get a pass because they are primarily webbers, but few other blaster ships will. If your blaster-fit Megathron is not getting picked up, this may be why. Nearly as important as investing in the right ship is fitting it properly. Again, this is going to be a question of merit and fitting the ship with the things the FC wants to see. If the FC has resigned himself to picking up a "Slow missile DPS" ship or two, he's going to look closely at the various Raven Navy Issues and he's going to pick the ones that are fit the best. Those with lesser fittings will not be picked up. As I said before, your L4 mission battleship is not fit properly for incursions! Even in the short time that I've been running incursions myself, I cannot begin to tell you the number of forlorn CCC-fit battleships I've seen posted again and again, waiting in vain for an FC that never comes. The reason you're not getting picked up is because your L4 mission ship is not equipped to deal with incursions, it's going to get blown up, and you're going to blame the rest of us. We don't want that hassle, and neither does your FC. You either need to buy a second battleship specifically for incursions, or you need to take a leap of faith and completely refit your mission battleship for incursions. Now, let's fit your incursion ship. We're going to be using EFT for this. If you're not familiar with EFT, then you're not ready for incursions. Since we're going to be shield-tanking, let's start with the mid slots. Ideally, have at least five of them (though a Megathron can squeak by with four). What's below are general principles intended for DPS ships; logistics ships have specific fittings for those ship classes and those should be used instead. Stop here and check your resistances. You're aiming for 70% resists across the board. Not 68%. Not 69%. 70% minimum (and more is better). If you're far short of 70% at this point -- say, one or more resists at 63% or less -- fit a Damage Control II and check them again. If everything is above 63% at this point, fill in using rigs. Add a shield resistance rig with the approriate resist for each resist between 63.1% and 70%. Probably, you'll only need one, and probably, that one will be the Anti-Thermal Screen Reinforcer of the appropriate size. If you can afford and use the Tech2 version, use it! We'll talk more about pimping out your ship a bit in a couple of steps, but this is a good place to start. If this still doesn't get all your resists above 70.0%, then you'll have to add either a third Invulnerability Field II or an active hardener of the appropriate type. Do that. Remember: 70% is the minimum; more is better! Once you get there, add a Core Defence Field Extender rig of the appropriate size and check two stats: your shield HP and your signature radius. If your signature radius is 150m or less, multiply your shield HP by two. If your battleship signature radius is 500m or more, or your cruiser signature radius is 200m or more, multiply your shield HP by 2/3. If, after this calculation, you have 10000 shield HP and 70% or higher resists across the board, congratulations! You're tanked properly for an incursion. If your shield HP is too low, you should add a second Core Defence Field Extender rig to make up the difference. You will be tempted to add a second LSE2. Don't! LSEs increase your signature radius dramatically and are self-defeating. Much of the DPS in an incursion comes from torpedo-fit Sansha bombers. These torpedoes hit you harder and do more damage if your signature radius is bigger. Take two Tengu fittings. One has a 193m sig radius and 14000 shield HP. The other has 17000 shield HP, but a sig radius of 284m. Even though the second one seems better-tanked, in practice, its tank will be worse. Multiplying the shield HP of a overly large sig radius cruiser-size hull by 2/3 reflects this. The second Tengu actually only has 11300 effective shield HP. Sure, the second Tengu will still successfully tank an incursion, but it's wasting a mid-slot that can be applied to other purposes. For this reason, stop at this point, and see if you can still meet the conditions above with two Core Defence Field Extenders and no Large Shield Extender II. If you can, this is the superior solution. CDFEs don't raise your sig radius nearly as much as LSE2s do. Alternately, you can also choose to pimp your ship out a bit using a Republic Fleet Large Shield Extender. The increase in sig radius provided by this faction module is smaller than that of the LSE2. In general, your overall EHP as measured in EFT should be 50000 or more for a cruiser (those with a very small sig radius can get away with less), and 100,000 or more for a battleship (ditto). Still, the calculation above is the more correct one. At this point, I'm going to assume that by the calculation above, you have at least 70% resists across the board and 10000 calculated shield HP. You may have consumed all of your rig slots and mid slots to get here. You may or may not have fit a Damage Control II. If you haven't done the latter, and you have lots of low slots, go ahead and add it! The shield resists it adds are not inconsiderable and adding a bit more resistance in this form is almost never a bad move. For the same reason, if you have lots and lots of mid slots (you're in a Scorpion Navy Issue, say), you can add an additional resistance mod to shore up your weakest resist a bit more, or add a third Invulnerability Field II to help them all. Ships with five or six mid slots should not do this, but ships with seven or eight can. You may have consumed all your rig slots. If you did, fine. If you didn't, use your third rig slot to add an "indirect" damage mod. Laser boats, such as Nightmares, should add either the Energy Locus Coordinator, or the Energy Discharge Elutriation. Missile boats should add the Warhead Rigor Catalyst. Projectile or Hybrid boats should add similar rigs to assist with the tracking, energy use, or range of their weapons. While you could add a second CDFE and increase your buffer, as long as your tank meets the standard in Step 2, it's better for the fleet if you do more damage or do damage at longer range instead. Fit your weapons next. If you're a DPS boat, this means short range turrets (but see the caution above about blasters). If you're a missile boat, this means long-range missiles. Short-range missiles don't work well against frigates, and those are going to be the bulk of your initial targets. If you have a drone bay, fill in some drones: a flight of Hobgoblin IIs to start. Bigger drones get eaten in incursion sites and you can't count on them. Next, let's fill in your low slots. A minimum of two damage mods, please: Ballistic Control Systems, Gyrostabilizers, or the like. Three is better. If you're a cruiser or battle-cruiser, consider adding a single Tracking Enhancer II. Remember, you're going to be shooting at a lot of frigates. If you're a battleship, you're going to be happiest with three tracking mods total, either Tracking Enhancer IIs or Tracking Computers. Fill these in using whatever you have more of, low slots or mid slots. Battleships should save either one low for a Signal Amplifier II or a mid for a Sensor Booster II. This will decrease your lock time against these very same frigates. Your slots are probably pretty close to full at this point, but now's the time to check your damage output and range. Whatever your ship, you need to be able to hit for good damage at 24km range or so. "Good" for a cruiser, battle-cruiser, or missile battleship is 500 DPS or more. "Good" for a turret battleship is 750 DPS or more. If you're not hitting at the right range, consider adding a Tracking Enhancer or Tracking Computer, or make your third rig one that increases your weapon range. If you're not doing enough DPS, add another damage mod or change the rig for one that adds DPS. We'll also be talking about faction damage mods in the next step. Still not hitting these numbers? Then change out for faction or Tech2 ammo. You will be making enough ISK that firing the more expensive ammo will be paid for by your profits. You should probably be using this ammo whether you can hit these numbers or not. The faster the fleet does DPS, the faster the site will be cleared, the faster you will make the ISK, and the more sites the fleet can run per hour. The expensive ammo is worth it, particularly if every ship in the fleet uses it. If you have any mid slots left, fill them in with utility e-war. The most useful mods are Stasis Webifiers and Target Painters. Dedicated webber ships such as Lokis should be carrying at least two webbers... three if you can. Pull off other utility mods to make this happen. Some ships will also benefit from an afterburner in a mid slot, particularly Minmatar ships. If you have any low slots left, fill in with Tracking Enhancers or a third (or fourth) damage mod. You may have one or two utility high slots left. If you're a cruiser, these can be Salvagers if you want to bring in a bit of extra money, or small/medium reppers if you want to help out the Logistics ships in a pinch. If you're a battleship, these slots should be filled with Large Energy Transfers... Tech2 if you can use them, 'Regard' Meta4 if you can't. There's two reasons for this: first, if one or more of your Logistics ships gets disconnected or otherwise disrupted, the battleships that can will be expected to be emergency cap transfer partners for the remaining logis. Second, many turret battleships are not quite cap stable but can become so if they trade cap back and forth with a partner. If you find yourself needing to add a "fitting mod" to make all this work, your skills are probably not up to par for running incursions. "Fitting mods" are Power Diagnostic Systems, Co-Processors, Reactor Control Systems, or the like. You're not adding shield boosters or more than one LSE2, and you have no need for power-hungry armor plates. Your power grid is therefore almost entirely devoted to your weapons. The bulk of your CPU will be going into your weapons and your damage mods, and as long as you have Weapon Upgrades V, this should not eat too much of your CPU, either. If you still find yourself running short of CPU, then you'll almost have to fit the faction damage mods, which use less. Fill in the rest of your drone bay. First, add a second flight of Hobgoblin IIs. As I said, drones get killed repeatedly and you'll need spares on hot standby. After that, if you can use them, add a flight of medium rep drones. Finally, if you can use them, add a flight of mining drones. Yes, really. One of the incursion sites may require a little mining, or you may be asked to launch the flight of mining drones and then abandon them for a faster ship to pick up and use. 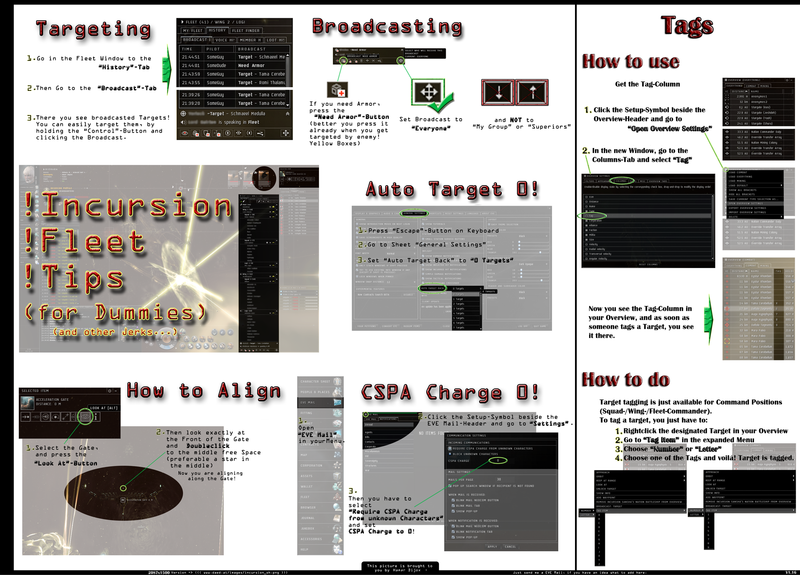 Tomorrow, I'll continue this guide by talking about where, how, and why you should "pimp out" your ship if you can, then talk about getting into the incursion channels and fleets themselves, and what will be expected of you once you're there.